The most dramatic sighting of the month was an enormous bush fire which had been raging in the Moremi Game Reserve for some time and one night jumped the channel into Kwara Reserve. Over the course of that weekend most of the open parts to the south of the reserve was burned flat with dried turpentine grass causing four metre flames. Fortunately, just about all of the trees and bushes survived the hot fast fire and we were blessed with beautiful rain the week afterwards which quickly produced a stunning carpet of green throughout the reserve. This new growth attracted a huge influx of grazers, which in turn attracted predators. Not that life was easy for the predators as they were no longer camouflaged by tall yellow grass. This was a disadvantage for the cats, but a big advantage for the prey animals – and of course safari-goers – who could now spot them easily at a distance. Towards the end of the month we were often able to spot lions, cheetah and wild dogs in one morning with lots of hunting and killing, mainly young impala, tsessebe and wildebeest. There was a changing of the guard with the lions at Splash with the two resident males moving out of the territory allowing space for two younger males to come in. The new very handsome boys made a big deal about staking their claim to the land around Splash with lots of roaring and marking. They managed to kill a buffalo near to camp at Lechwe Plains and spent four days feeding on it. The two males were found with a lioness from Mother Eye Pride who was being mated, later the honeymoon couple came to the pan in front of Splash for a drink. The Splash pride of two females with their six cubs were not seen as regularly now that their males had moved, but we after seeing a large number of vultures we located them looking well fed and resting. This pride seemed to be sensibly staying away from the new males who might well kill their cubs, so have moved all the way across to the Kwara camp side of the reserve. They appeared to be in great condition and doing well. We were lucky to have two packs of wild dogs on the Kwara reserve during December, a pack of twenty-six and a pack of four. We saw them on different occasions hunting around Splash camp, the pack of twenty six were specialising in attacking tsessebe calves, sometimes killing two at a time. A female cheetah killed an impala lamb in front of camp one day and after she had finished eating spent her day relaxing at Splash Hippos. The following day we found the resident male, Special, tracking the female but he did not manage to find her. We continued to see Special regularly throughout the month, this well-known individual often posing beautifully up on termite mounds as he scanned for prey. We saw him taking down young reedbuck, a species who would usually reply on the cover of long grass but who were now left vulnerable after the fire. Our guides were happy when a resident female leopard who had not been seen for some time reappeared and seemed to be heavily pregnant. We watched her hunting red lechwe but she was not lucky. Two other leopards appeared north of Kwara and a new very relaxed male leopard has started to show up to the east of Splash. An aardwolf den was still active at the start of the month giving guests good sightings of this elusive creature. Bat-eared foxes also had an active den. Nocturnal animals such as civets, serval, genets and porcupine were also located in the area frequently. Spotted hyenas were denning at Kwara camp. The burned area after the fire attracted many birds of prey including tawny eagles, booted eagles, steppe eagles and Wahlberg’s eagles feeding on termites that started to fly out after the rains. Ground hornbills were often seen near to the airstrip. November was an exciting month at Splash camp. Antelope species such as impala and tsessebe started to drop their young meaning that predators were able to enjoy easy pickings and were making frequent kills. Even baboons were seen feeding on new impala lambs. The Splash pride of ten were often around camp, the two male lions very vocal in the evenings. One time the two lionesses relaxed for the day between rooms two and three. Although on their own that time, the two lionesses had three cubs each and we found the six cubs of the Splash pride were increasingly left on their own whilst the adults went hunting. Once, surprisingly, they were alone with the fresh kill of a steenbok lamb. A few days later we found two of the cubs separated from the other four and for a worrying time we didn’t see those two at all. Eventually by the middle of the month, to everyone’s relief, they had reappeared. One of the resident males from the Splash pride was seen fighting with a nomadic intruder. Three females from the Mother Eye pride were seen with a male and the youngest lioness appeared to be pregnant. Two males were seen feeding on a dead hippo surrounded by vultures awaiting their turn at the carcass. The resident pack of eight adults and nine puppies were seen regularly, mostly specialising on impala but we also saw them hunting zebra. One time they came right into camp hunting, so guests and guides quickly abandoned their early morning breakfast to try and keep up with the dogs. On another occasion two adult and two young wild dogs made a kill of an impala right by the parking area whilst the guests were out on game drive. A different pack of six adults and four puppies were located once with their faces covered in blood. The resident male cheetah known as Special was seen frequently. One morning he led us on a marshland exploration, stalked a herd of red lechwe and with explosive energy killed one antelope and dragged it to the shade. He lay panting for fifteen minutes before starting to eat and enjoy his reward for a successful hunt. We followed the female cheetah hunting and watched as she brought down and killed an impala. She was also seen hunting reedbuck and feeding on a red lechwe lamb. Spotted hyenas were seen every few days including a female nursing two cubs at a den near to the old Kwara camp. November was a good month for sightings of the smaller mammals. An aardwolf den was located on Cheetah Plains and the animals allowed us good time with them. We were able to enjoy a wonderful sighting of an African civet which was unusually relaxed and our guests were able to take great photos under spotlight. We also located serval on more than one occasion as well as African wild cat. A pair of bat-eared foxes have a den west of Impala Pan. The resident female leopard made a kill of a Common Reedbuck near to Sable Island and feasted for two nights, but she left the carcass on the ground and eventually it was stolen by hyenas. A pair of young leopards who had been moving around as a brother and sister appeared to have separated and we saw the male more than once. Another male leopard was concentrating on hunting the area west of Impala Pan. 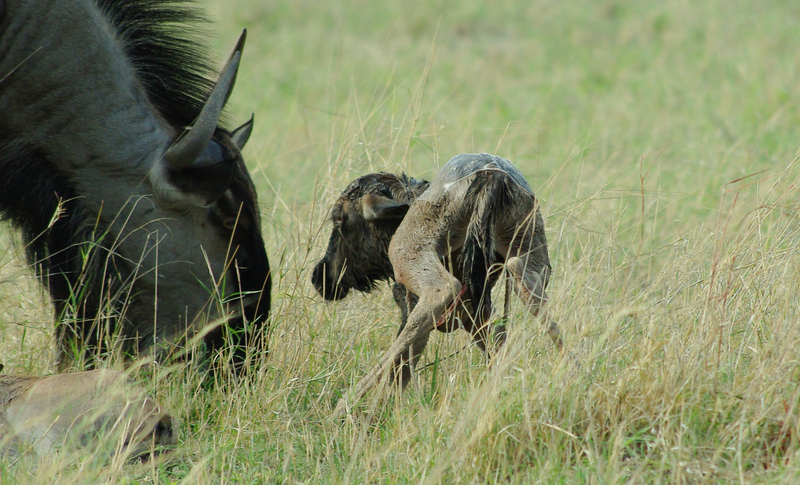 Not for the faint-hearted, guests watched as a leopard ate a minutes-old tsessebe calf. As always in the Okavango Delta the mokoro excursions are popular and allowed guests to see smaller creatures such as the painted reed frogs and enjoy beautiful water lilies. More than once after mokoro activity herds of elephants and bachelor buffaloes came to drink and wallow at the mokoro station much to the delight of guests who quickly swapped fishing rods for cameras to capture the moment. Guests were thrilled to spot the elusive Pel’s Fishing Owl during a boat cruise and we also saw barn owls and eagle owls. An unusual highlight for some keen birders was a black-chested snake-eagle taking down a night heron. There was incredible predator action at Splash during October with lions being seen every single day. On average our guides and trackers managed to find three predator sightings per day and on some dates there was a “full house” of lion, leopard, wild dogs, cheetah and hyena. A pack of four wild dogs, two adults and two sub-adults, were seen chasing impala around camp and were successful in bringing down their prey making a fantastic end to the afternoon safari that day. They were seen often hunting around the camp after that, sometimes making kills. One time they interrupted early morning breakfast with a kill right by the front entrance, Another time they almost lost their kill to leopards. A different pack of five adults and four young were located near to Motswiri Pan where they had just finished devouring an impala. A third pack of eighteen, the dogs who denned in June at Little Kwara, were seen one day resting next to the airstrip, much to the delight of departing guests who had mistakenly thought that their safari was finished. When staying on the Kwara Reserve you shouldn’t pack your camera away until the very last second! An alarm call from a side-striped jackal alerted us to the presence of a predator one morning. We picked up cheetah tracks and followed them until we found the beautiful resident female looking relaxed and well-fed. A resident male was seen on the majority of days during October. He was mostly resting or patrolling his territory but a few times he was hunting and we were lucky enough to be able to see him make his kill. The Splash pride of lions was seen in front of camp drinking water, making for a wonderful photographic opportunity. The pride consists of two males, two females and six cubs. The mothers were very protective of their cubs, always hiding them away in the Kalahari Apple Leaf during the days before venturing out to drink at the camp waterhole. A male lion was heard roaring north east of camp so we explored in that direction and came across him with two females relaxing in the early morning sun. Two male lions known as ‘Puffie’ and ‘Big Man’ had killed a hippo but they were displaced from their hard-won carcass by the two resident males of the Splash pride. When we visited the area the next day all the lions had gone and been replaced by an impressive clan of twenty three hyena gorging themselves on the huge carcass, surrounded by vultures. We also came across spotted hyenas bathing in water, trying to find relief from the soaring temperatures. We enjoyed tracking a leopard to New Bridge and our guests appreciated the effort taken to locate the handsome tom. After an hour and a half we found the cat in the process of killing a baboon. Spotted hyenas were also in the area as they had also been following the leopard, but the tom was successful in driving them away and hanging onto his carcass. Two female leopards, a mother and daughter, responded to the call of a side-striped jackal. We followed them as they discovered that the jackal was alarmed by wild dogs who had killed an impala, but the wild dogs had finished their kill by the time the leopards arrived and moved off. General game in the area was rewarding, including beautiful roan antelope. Elephants, giraffe and buffalo were plentiful. Other plains game species included zebra, kudu, wildebeest, warthog, waterbuck, impala and red lechwe. Troops of baboons and vervet monkeys entertained guests with their playful antics. We saw an encouraging number of vultures in the area including hooded, white-backed and a few white-headed. We were excited to see lappet-faced vultures nesting east of Splash camp. There were plenty of ground hornbills, some of whom had chicks. A pair of secretary birds was nesting near to Impala Pan. Two lionesses had a den near to Mabala Dikgokong where they were raising six cubs. 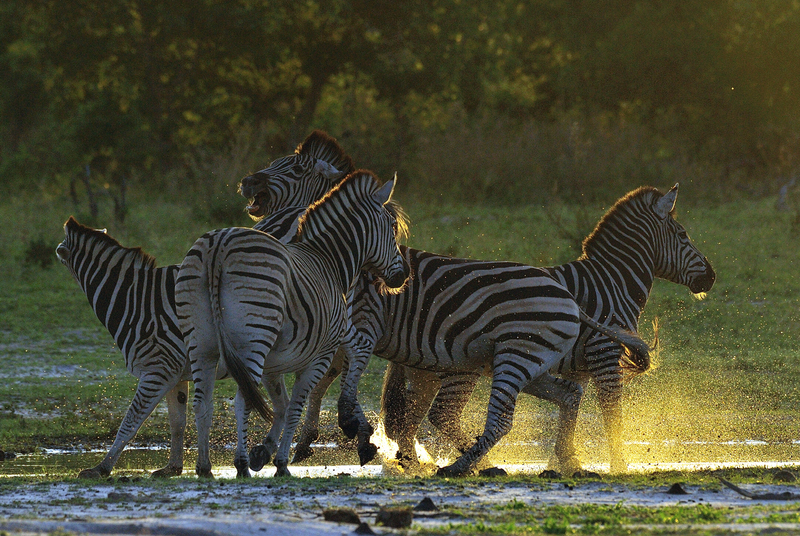 They were seen very often and our guiding team now fondly refer to them as the ‘Splash Pride’. They were often near to their den, feeding on impala, reedbuck, and zebra kills (the pride was so effective that they were collectively described by one guide as “a killing machine”!) The cubs were very active, usually playing around, and we enjoyed watching them nurse from their mothers. One day we had a gorgeous sighting of them drinking at a waterhole, their perfect reflection making for a wonderful photo opportunity. They were disturbed from their original den by two females from the Mma Leitho pride, but continued to be sighted most days. After chasing off the Splash Pride the females of Mma Leitho joined up with two resident males and ended up killing a tsessebe together. Two new male lions were seen to the east of Splash. A big pack of twenty two wild dogs was seen on the eastern side of the Kwara reserve and were regularly targeting impala. The Kwara pack of wild dogs appeared again after about a month’s absence. During their time away they appeared to have lost one of their puppies, but still had ten youngsters, now hunting with the adults. We saw that they managed to kill a red lechwe, a reedbuck and also an impala, although lions drove them off the latter and took over the carcass. A third pack of just three adults with two puppies were found on the eastern side of the Kwara reserve and were seen feeding on an impala. The resident male cheetah, affectionally known as “Special” was following his usual pattern of traversing the whole Kwara reserve from east to west. He was seen feeding on a warthog piglet and we also saw him chase down and kill and impala. He killed an adult warthog near to the Old Mokoro Station where we saw him feasting, surrounded by hungry vultures and side-striped jackals. On one day we saw a fascinating intraspecific competition: the male cheetah killed an impala but was driven away by a leopard and in turn the carcass was stolen by the lions. We followed a new female cheetah as she hunted, although she was not lucky on that occasion. There was also a new male cheetah in the area. 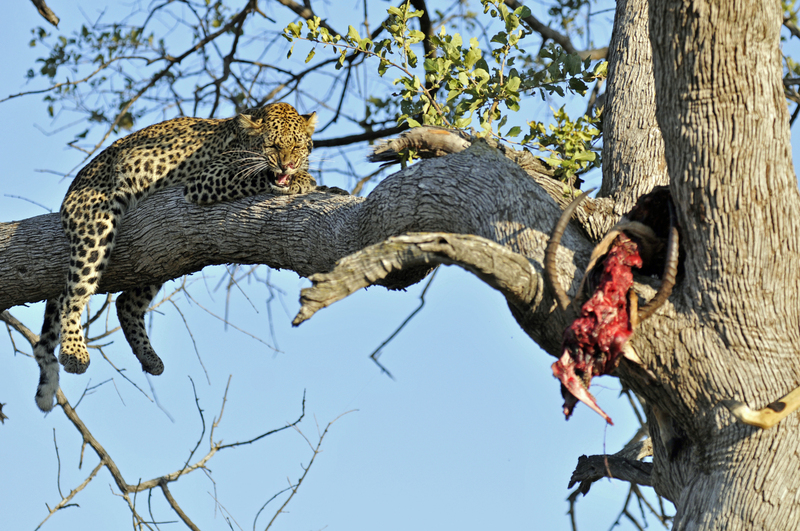 To gain respite from the steadily-increasing daytime heat the leopards were enjoying resting on shady branches of the Sausage Trees which were now in full bloom displaying striking blood-red flowers. 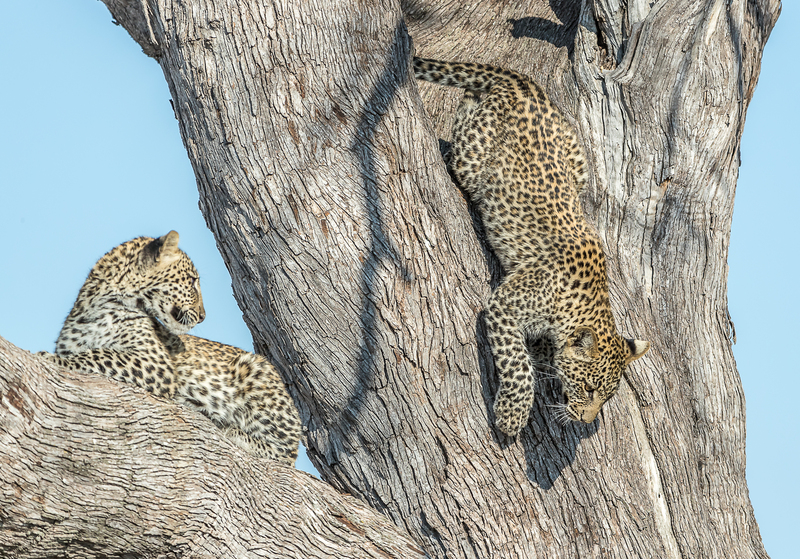 We found a male and female leopard together on such a tree, but the female was a little skittish and jumped down. A female leopard in the Splash area was gradually getting used to the safari vehicles and one day was seen drinking at the camp waterhole. We managed to drive around to take a closer look and after initially ducking into some bushes she came out and rested on a termite mound giving us a better opportunity to enjoy her. There was also a young male resident in the area. Spotted hyena were often seen in the Splash area, and inside camp itself. There were lots of elephants in the area, with a breeding herd coming to drink at the camp waterhole in the afternoons. Further afield we enjoyed watching elephants cross the channels and especially seeing how they worked together to help their calves climb up the steeper banks. Bachelor herds of buffalo bulls were seen regularly in the marsh where we watched them feeding and mud-bathing. Overall, the general game was very plentiful. A honey badger was seen killing a rock python in an incredible tussle. By the start of September the flood waters were high and had attracted lots of waterbirds to the area including herons, slaty egrets and carmine bee-eaters. The heronry sites at Xobega and Gadikwe were both active. Yellow-billed kites had returned to the area for the summer months. As is often the case in the Kwara Reserve, the fierce intra-specific competition between predators led to some interesting sightings. One morning a sub-adult female leopard was located feeding on an impala carcass up a tree. Whilst we were watching her a pack of wild dogs appeared opposite her and then a male lion came along the same road. The lion killed one of the puppies meaning that there are only eight left with four adults. Although the guests were sad at the way the morning turned out for the dogs, it was a fascinating to witness the interaction between three of the major predators in the region. The same sub-adult female leopard was located on a giraffe carcass. She leapt up into a nearby tree and started to eat a kill she had previously stashed there of a side-striped jackal. Two sub-adult leopards who are brother and sister were seen in the Machaba area for over two weeks. They were very relaxed around the game viewers and we were able to enjoy watching them stalking francolins. We were blessed with separate packs of wild dogs during August, a pack of two with three puppies were often hunting impala around Splash camp and we found them on their kills. Another pack comprising four adults with eight puppies (having lost one to the lions). They also came right through the middle of Splash camp just as the guests were finishing their tea. We immediately dashed to the vehicles and were lucky enough to see the dogs make a kill east of camp. Each time we saw this pack and their puppies they seemed a little bit more relaxed around the vehicles than the previous time. A female cheetah with two cubs was seen moving away from a troop of baboons; she was being followed by the resident male known as “Mr Special”. We left them looking well fed and resting under the Kalahari apple-leaf trees. It was a busy month for the male cheetah as he traversed huge areas from west to east and was seen actively marking his territory. Towards the end of the month he was tending to stay on the west of the Kwara Reserve, the guides thought that this was perhaps because of the increased lion activity on the eastern side. We saw the cheetahs regularly on impala kills. On one particularly rewarding morning we saw both Special and the female with two cubs on two separate kills. The resident pride of lions near to Splash comprised two males and two females. The younger male was seen mating with a female with the others resting about seventy metres away. We found two of them scavenging on a carcass that they stole from the wild dogs. In another area two lionesses with their six cubs were having a productive time, successfully killing two kudus on two consecutive days. For the first times we saw this pride together with the two males who had fathered the cubs and it was great to see them all socialising together. On another game drive we found the pride of eight on a fresh impala kill. A few minutes later a clan of eight spotted hyena came and stole the kill from the lions. On a different day we discovered the hyenas looking well-fed and covered in blood. We back-tracked and found a giraffe carcass loaded with vultures. 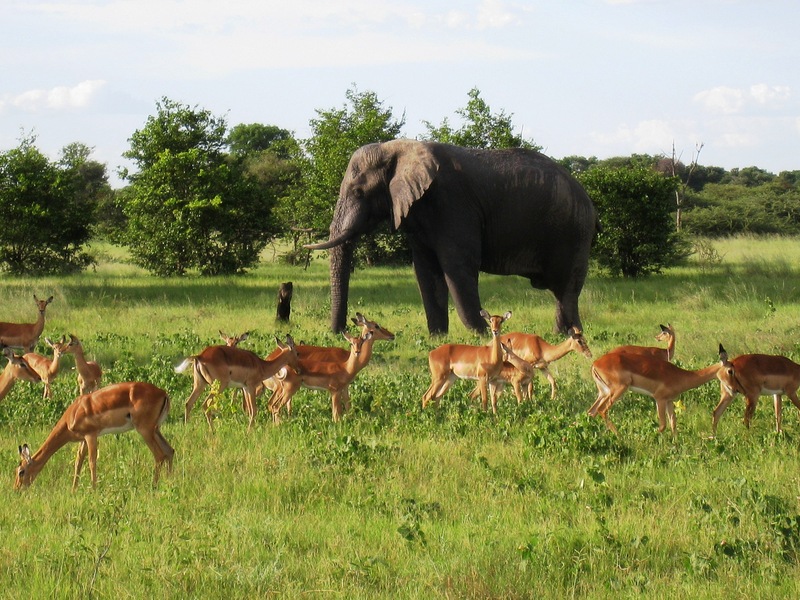 Big breeding herds of elephant could be seen feeding and bathing near to Lechwe Plains. Two honey badgers made themselves at home foraging around the camp paths on a daily basis. A relaxed serval was discovered twice in one week at Lechwe Plains. Wildcat were also hunting around Splash Hippos. A Slaty Egret was resident east of the airstrip at the bridge crossing. Ground hornbills were encountered at the Splash Camp walking range. 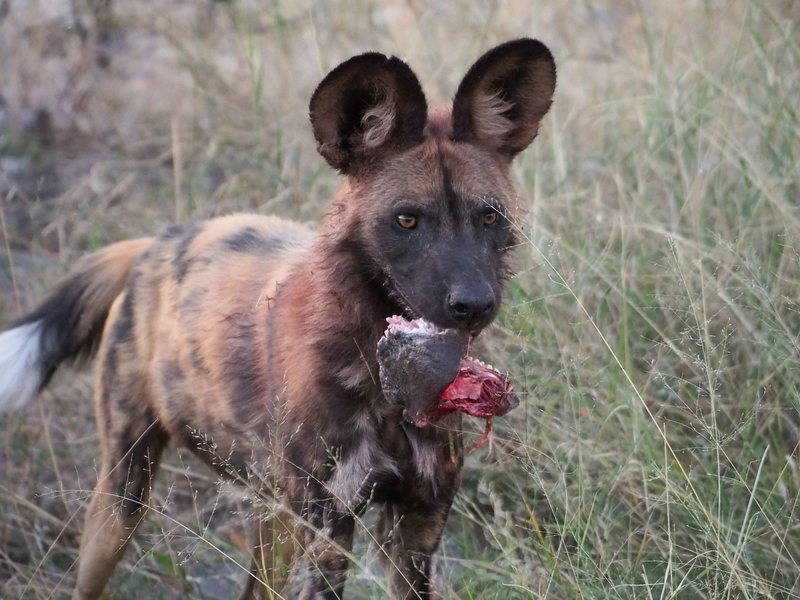 At the start of the month the wild dog den near to the airstrip was still very active and guests enjoyed fabulous sightings of the two-month-old puppies playing and being fed regurgitated meat by the adults. There were still eight adults and eleven puppies and all of the dogs looked in great condition. Towards the end of the month, as the floods started to rise in the area, the pack relocated out of the Kwara Reserve but luck was on our side because around the same time a different pack of dogs turned up at Splash camp and on two consecutive nights made kills very near to Room 8. We subsequently found that they had a den near to the Old Mokoro Station. Two big resident male lions were occupying the territory near to Splash and we found them mating with two females. It seemed to be a marathon double date, with the four lions mating every fifteen minutes over the course of five days. The same lions were spotted stalking zebras at the waterhole in front of Splash camp and sometimes came into camp itself. One night they stole a kill from the wild dogs just in front of our Head Guide’s room and then continued with their mating. The guide had just popped back to his room to pick something up before dinner only to find that he couldn’t leave because of the lions. When he didn’t appear for dinner a vehicle was quickly dispatched to collect him! Two new females near to Mabala Motlotse were found with six young cubs. One-eyed pride was located scanning for potential prey species with lots of red lechwe antelope in the area. The female leopard with two cubs changed her den to a spot at Third Bridge. The cubs were very playful and curious, even coming right underneath our vehicles. The mother seemed very relaxed sleeping in a nearby tree. We also found her with impala kills in the trees, usually by herself whilst the cubs stayed behind in the den. Another time we found her with a reedbuck kill near to the airstrip. A different young female was found hunting a honey badger, but true to its reputation the honey badger defended itself very aggressively and eventually won the encounter. Another time we found the same leopard feeding on an African civet. 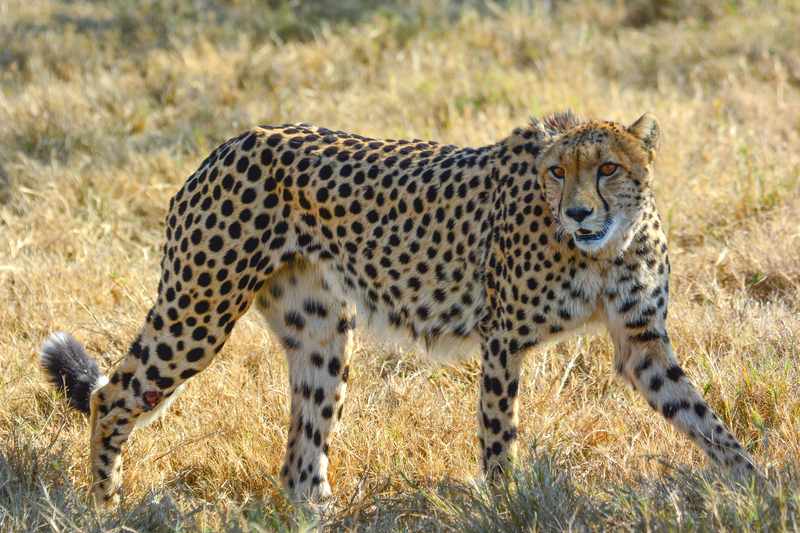 The resident male cheetah, known as “Special” was found hunting and killing a reedbuck. We also saw him at other times feeding on kills or resting on termite mounds. Nearer to Splash we were excited to find two young cheetah males who were new to the area. We spotted them hunting and followed them for a couple of days, eventually being rewarded with seeing them kill an impala by Tsessebe Pan. A large honey badger was frequently seen shuffling along the paths at Splash camp and encountered by guides and guests as they were walking to and from their rooms in the evenings and early mornings. He was not in the slightest aggressive, and it was a treat for guests to see this animal whilst on foot. Other small mammals spotted were servals, civets, genets, jackals and mongoose. General game was excellent with big herds of elephants, zebras, giraffe, wildebeest, impala, reedbuck and red lechwe. Big herds of elephants were coming down to the waterhole in front of Splash camp to drink every evening. Notable bird species recorded included Verreaux’s eagle owl, marsh owls, secretary birds, ground hornbills, wattled cranes, African fish eagles and martial eagles. The wild dog pack of 8 adults and 11 puppies were denning close to Little Kwara camp. We were able to witness them making successful kills and then returning to the den to regurgitate food for the alpha female. Guests really enjoyed seeing the mother nursing her pups. From the 10th of June the pack relocated to an old hyena den nearby and by that stage the puppies were also starting to eat the meat that the adult pack members were providing. The spotted hyena den was also very active with five young cubs. Guests enjoyed watching them playing with their siblings and the adults. The cubs also seemed to take a liking to our vehicles and came close trying to chew the tyres. A female leopard with her two cubs was located very often at her den site and the cubs appeared to be in good condition. Hyenas stole reedbuck kills from her a couple of times, but we also saw her with impala carcasses, taken up the tree for safety. Her cubs were about two months old and very playful. We had delightful sightings of them climbing trees and playing with their mother’s tail. 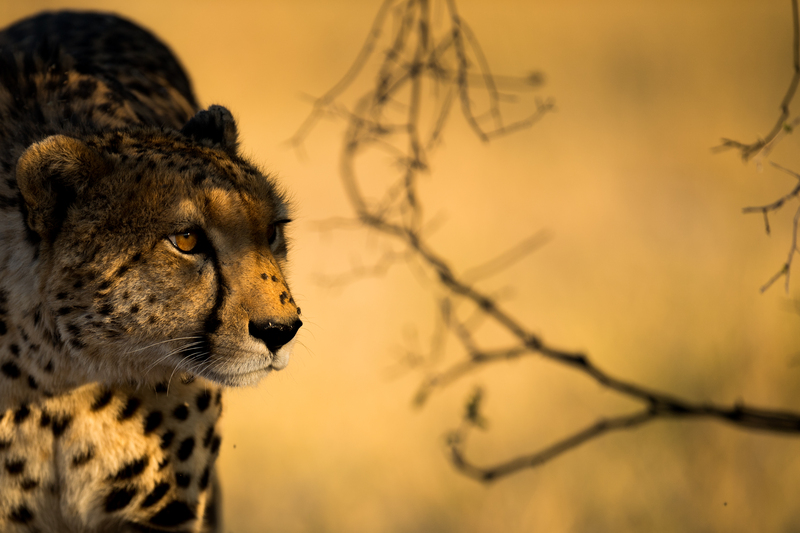 The resident male cheetah known as “Special” was seen throughout the month. At the start of the June we saw him by the old mokoro station trying to hunt a warthog, but in a dramatic encounter the warthog fiercely fought him and he suffered an injury. Luckily he was not hurt too badly and to everyone’s relief we saw him the following evening chasing red lechwes though he was not successful that time or the next day. By the end of the month he seemed to be back on form and we saw him eating well on impala. Four male lions had formed a coalition, although often seen in pairs. They appeared to be in good condition. One day we saw two of them in a stand-off with one of the Zulu Boy males. They were fighting over the carcass of a baby hippo and roaring at each other. Two lioness sisters were located nursing cubs of about 3-4 months old and were seen again feasting on a tsessebe carcass. The six cubs were initially nervous, but were getting used to the vehicles and settling quickly after the engine was switched off. There was another lioness seen often at Splash drinking from the waterhole in front of camp. The guides suspected that she was lactating so perhaps had cubs nearby. Guests enjoyed watching a very relaxed honey badger who was digging for mice. Aardwolf, porcupine, serval and African civet were all seen during night drives. General game included plentiful giraffe, zebra, tsessebe and wildebeest. Elephants were seen in good numbers, especially towards Splash hippos. A breeding herd of forty buffalo was located. At Splash the general game and birdlife in front of camp was excellent, with many species coming to the waterhole to drink. Lions and hyenas could frequently be heard at night calling from within camp. Elephant and buffalo were also seen nearby. Bird species seen during the month included martial eagle, saddle-billed storks, marabou storks, secretary birds and the endangered ground hornbill. A Verreaux’s (giant) eagle owl was roosting every night in the camp island. A large flock of pelicans were seen at Splash camp. The boat cruises continued to provide lovely bird sightings including African fish eagle herons and spoonbills. May was an incredible month for predator action on the Kwara concession. Leopard, wild dogs and hyenas were all denning during the month and we witnessed some incredible interaction between the species. The pack of eight wilddogs were still denning about half a kilometre from Little Kwara for the month of May. At the start of the month the alpha female was inside the den and was even growling at the alpha male if he came too close. On the same afternoon, once the dogs had killed an impala, a spotted hyena came to scavenge and it was also badly bitten by the wild dogs. The clan of hyena continued to follow the dogs every day on their hunting missions and we witnessed further dramatic interactions between these two predator species as the month went on. Despite the raiding hyenas, the dogs were able to kill very regularly and all looked in good condition. The spotted hyenas had their own young to look after and we were able to visit the den regularly. The cubs could be seen playing and occasionally yelling at their mother for her to lie down and nurse them. Our female resident leopard also had cubs in a den; she was seen feeding well on various kills and looked in excellent condition, despite having some carcasses stolen by hyenas. We watched her on her hunting excursions making full use of the camp’s bridges to traverse the area and we had wonderful sightings of her climbing trees. Her initial den was not accessible to our vehicles, but after a week or so she moved her cubs and then we were able to enjoy watching the family interacting together. A male leopard was also located to the east of the Kwara airstrip. Lion were doing well in the Kwara Reserve including a pride of three lionesses and five sub-adult cubs. A different pride of two females and two males were located at Four Rivers, on the western side of the concession. One afternoon we located a female lioness, daughter of resident Mma Leitlho, travelling towards camp and after following her for a while we were lucky enough to witness her stalking and then bringing down a fully-grown warthog boar. We also found lions feeding on kudu and zebra. 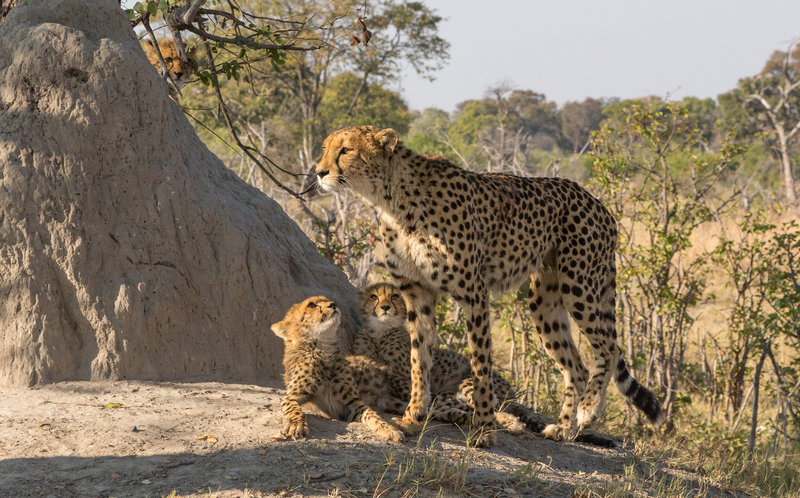 A female cheetah with two sub-adult cubs made a successful kill of a male impala at bat-eared fox den. 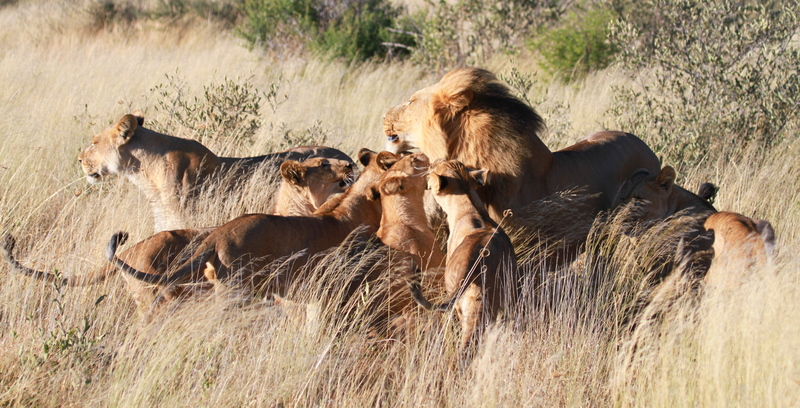 They were agitated by lionesses who were roaring not far away from where they made a kill. The male cheetah, known to the guides as ‘Special’ was seen often and one day walked all the way from the airstrip and into camp, passing in between Kwara and Little Kwara. As he was stalking a herd of impala the wild dogs came and ambushed him, but he managed to escape. We found a different male cheetah feeding on an impala close to Splash, surrounded by vultures awaiting their turn at the carcass. This cheetah was also seen scent marking on a sausage tree whilst also using the vantage point to scan the area for prey and danger. The general game in Kwara Reserve was excellent, with plenty of breeding herds of elephant coming back into the area. We watched them as they were feeding, drinking and bathing in the waterholes. There were plentiful herds of wildebeest, zebra and giraffe. Two giraffe bulls were seen fighting over females; it is always a dramatic sight watching such huge animals swing blows at each other with their head and necks. The rest of the giraffe family seemed unperturbed though and carried on browsing whilst the fight went on. Smaller mammals which we were able to view included a very relaxed serval and honey badgers. Bird life was excellent with endangered Wattled Cranes a notable favourite with our guests. A Verreux’s (giant) eagle owl was seen feeding on a small spotted genet.